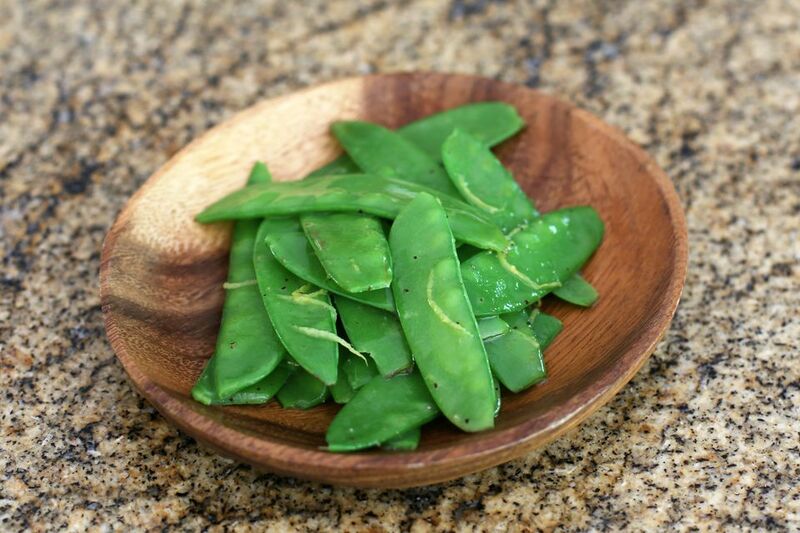 Snow peas are a crunchy and delicious vegetable, and they take just seconds to cook. These easy snow peas are prepared with a simple combination of butter and shredded lemon zest. Feel free to add sliced toasted almonds to the peas along with the lemon. Unlike sugar snap peas, the peas in snow peas are tiny. The quick boil shouldn't be more than 1 minute or the pods will lose their crunch. The peas are an excellent side dish with shrimp, fish, or other seafood, or serve them with a chicken dish. Break the stem ends off of the snow peas and pull off the strings. Rinse well. Fill a medium saucepan with about 2 quarts of water and 2 teaspoons of salt. Bring the water to a boil over high heat. Add the snow peas and then bring the water back to a boil. Boil the pea pods for 30 to 45 seconds. Don't overcook them or they will lose their fabulous crunch. Drain the peas in a colander and wipe the pan out. Add the butter to the pan and place it over medium heat. When the butter begins to sizzle, add the drained snow peas. Saute the pea pods in the butter, stirring, for about 1 minute. Add the lemon and toasted almonds (if using) and continue cooking for 1 minute. *To toast sliced or slivered almonds, put them in a dry skillet and place the skillet over medium heat. Cook, stirring and turning frequently until the almonds are lightly browned. To toast them in the oven, arrange them in one layer in a shallow baking pan. Bake in a preheated 350 F oven for about 10 to 15 minutes, turning occasionally, or until they are lightly browned. Some other herbs and flavor additions that complement pea pods nicely are mushrooms, peanuts, ginger, garlic, parsley, basil, and chervil. To add some garlic flavor, peel 1 clove of garlic and cut in half. Saute the garlic pieces in the butter for 1 minute. Remove the garlic and discard; add the snow peas to the butter. Saute for about 1 minute. Add the lemon zest and almonds, if using; continue cooking for 1 minute. Season the pea pods with salt and freshly ground black pepper as desired.